As I said, Octopi is plug and play so you just need to download the image and install it in your SD card. Init the Raspberry pi, and you will see a tiny set up screen where you can expand the filesystem, overclock the pi, enable the pi camera… All of this steps are optional so you can click on finish if you want, but I recomend at least expanding the filesystem so it uses the whole space in your SD card. 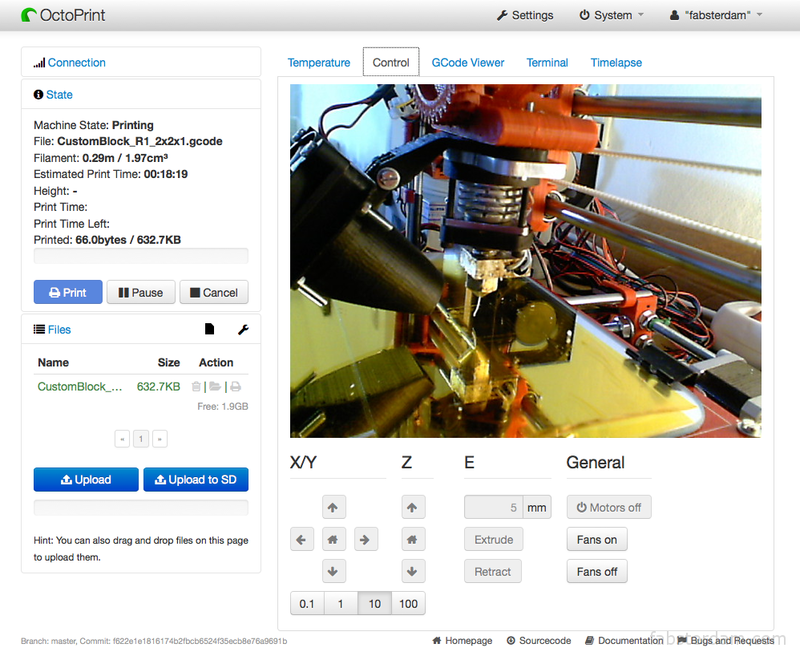 From the Control tab you can just do what it sais: move the printer in the X, Y and Z axis as well as swich on/off fans and extrude/retract. Just like you do with your normal software. 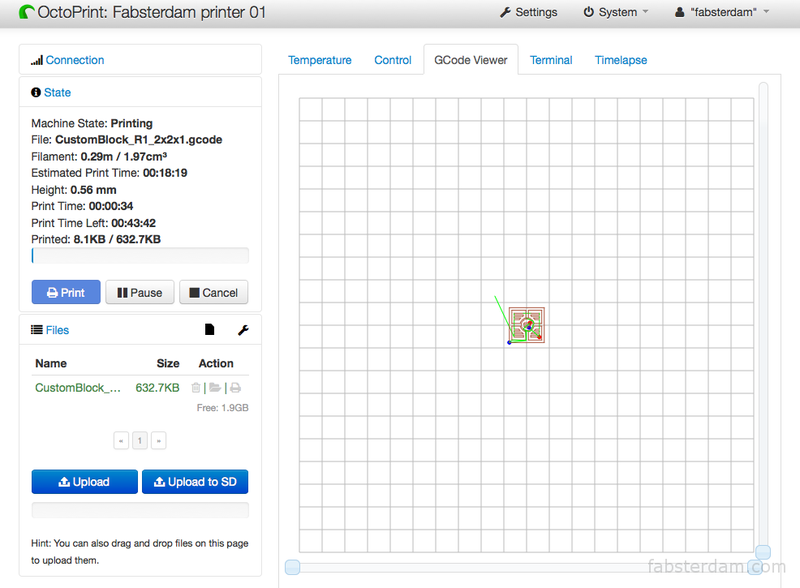 The GCode Viewer tab shows you what is being printed in real time. You can also navigate through the layers and see some other info like the speed at which each part is printed (shown with different colors in the grid). Finally, the Terminal Tab let you send and recive commands from your printer. You can also see the status of the machine if it’s in stand by mode. The last tab, Timelapse, let you configure the timelapse settings and shows you all the captured video files. I didn’t do any screenshot of it, as it’s super tiny configuration menu as well as pretty straight forward. 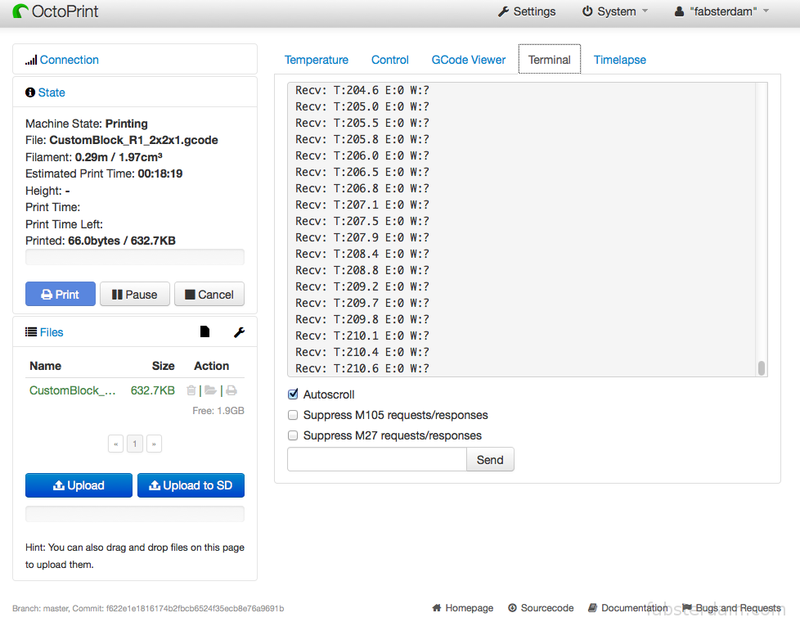 For the moment we’re quite happy with the Octopi server, specially with the timelapse function. We’ve plugged a Logitech webcam while we wait for our Raspberry pi camera module and it works really good. We’ll explain in other post how we hooked up the pi in the back of the printer and used the power supply of the printer to also power the pi throught the gpio ports.